McLean, VA – May 15, 2018 – For the second consecutive year, Bart & Associates, Inc. (B&A) is proud to announce that both B&A and Jonathan Evans, President, have been chosen by the Northern Virginia Chamber of Commerce as nominees for the Outstanding Corporate Citizenship Awards. B&A has been nominated for the “Outstanding Corporate Citizen of the Year” in the Small Business category and Mr. Evans has been selected as a nominee for “Executive Leader of the Year”. “We are truly honored to not only have B&A recognized for this impressive award, but also to have Jonathan recognized for his commitment to philanthropy and creating a better community,” said Paul Mangus, co-founder of B&A. 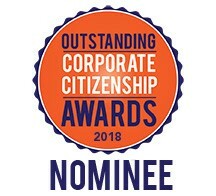 The Northern Virginia Chamber’s Outstanding Corporate Citizenship Awards honor individuals, businesses, and non-profits for above-and-beyond business leadership, employee engagement, and corporate social responsibility. The winners will be announced at the Awards luncheon held on Wednesday, June 13, 2018 at The Ritz Carlton Tysons.